We are now at the halfway point of the 2017 NFL regular season, and we still don't have a resolution to this whole Ezekiel Elliott suspension mess. I really didn't want to talk about this again, but it's likely the biggest thing that will happen in the league this week barring a surprising big name traded before Tuesday's deadline. The Cowboys (4-3) absolutely are good enough to win the NFC if Elliott avoids that six-game ban until the start of next year. Dallas has won back-to-back games, and Elliott has combined for 297 yards rushing and five TDs (one receiving) in those. He joined Hall of Famer Tony Dorsett as the only players in Cowboys history with 100 rushing yards and multiple rushing touchdowns in consecutive games. Elliott was headed back to federal court on Monday in New York (he will be there in person) with the NFLPA asking a judge to grant a preliminary injunction that could keep Elliott eligible to play for the remainder of the season. 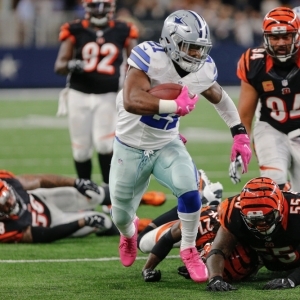 "We're confident in our argument," said Elliott to the Dallas media on Sunday. "We're confident that I'll be on the field for the rest of the year." Elliott has been playing because another court gave him a temporary restraining order on the six-game ban, but that is expiring. So it's up to U.S. District Judge Katherine Polk Failla to determine Elliott's fate. He's going to serve this suspension at some point, but might be able to delay it a full season with another legal win much like Tom Brady did. Failla isn't likely to make a ruling on Monday, but it should come not long after. I'm sure competitors in any of your fantasy leagues are hoarding either Alfred Morris or Darren McFadden in case Elliott is suspended. He would miss games vs. Kansas City (this Sunday - Tony Romo calls his first Dallas game for CBS), in Atlanta, vs. Philadelphia, vs. LA Chargers, vs. Washington and at NY Giants. Elliott would return for a Sunday night Week 15 game in Oakland. The Cowboys are currently +900 to win the conference. Those odds will get longer if Elliott is suspended. Cowboys owner Jerry Jones doesn't think Elliott did anything wrong and has been at odds with Commissioner Roger Goodell over this and the whole anthem fiasco. In fact, Jones led a bloc of owners last week attempting to stop Goodell's contract extension, but that failed. Goodell's new deal with the league will run until 2024. The league would need 24 owners to approve of Goodell's firing. Here are some Week 9 early lines that caught my eye. I won't touch on Thursday's game (Bills-Jets), my in-depth Sunday matchup (likely Bengals-Jaguars) or the Monday night game (Lions-Packers) as I will be previewing them here individually. Colts at Texans (-13, 48): This has the highest spread by a mile on the board. How entertaining was Sunday's Texans-Seahawks game? Seattle won 41-38 in a back-and-forth affair that saw Texans rookie quarterback Deshaun Watson throw for 402 yards and four touchdowns to go with 67 yards on the ground. He's not just the first rookie with 400 passing yards, four touchdowns and 50 rushing yards in a game but the first player ever. There must be so many teams kicking themselves -- I'm talking to you Cleveland! -- for passing on him in the first 11 picks of this year's draft. Watson could have a nice rivalry going forward with Indy's Andrew Luck, but that probably has to wait until next year as it's not likely Luck will play at all this season off his shoulder surgery. Indy's two victories remain against the NFL's two winless clubs in the 49ers and Browns. I think the Colts are staring at a 2-14 record for the first time since 2011, which is what got them Luck in the 2012 draft. Don't be surprised if the Colts trade a starter or two by Tuesday as they are essentially punting on the season. Reportedly, star WR Ty Hilton is available, as is top cornerback Vontae Davis. The Pick: Colts (can't pass up 13 points). Bucs at Saints (-7, 50): I'm officially off the Tampa Bay bandwagon. The Bucs dropped a fourth straight on Sunday, 17-3 at home to Carolina. Jameis Winston played through a shoulder injury and it showed as he completed just 55.3 percent of his passes (2 of 11 on third and fourth down) with two interceptions on a lost fumble on a silly play. The former Heisman winner hasn't taken the giant leap forward that I thought he would in Year 3. There might come a point where the Bucs have to punt on this season and get Winston off the field and healthy. Think I am on the bandwagon of the NFC South-leading Saints as they now have a running game and a defense. New Orleans failed to cover Sunday but did beat Chicago 20-12. Drew Brees had his 6,000th career completion in the game, become the third player to reach that milestone (Brett Favre an Peyton Manning) and the fastest to do it, coming in his 240th career game. The Saints and Bucs split last year, each winning at home. The Pick: Saints (shop or buy down to 6.5). Cardinals at 49ers (+2, 39): If San Francisco is going to avoid 0-16, it probably has to happen either this week or next vs. the Giants. The 49ers don't have to worry about facing Carson Palmer here as the Cardinals begin life without their QB due to a broken arm, although he hopes to return before the end of the season. Drew Stanton takes over with Arizona coming off its bye week. Stanton is 6-3 in his career starting in place of Palmer. The Niners had been very competitive, but that has changed the past two weeks with rookie quarterback C.J. Beathard starting as they have been outscored 73-20 in losses to the Cowboys and Eagles. San Francisco nearly upset the Cardinals in Week 4 in the desert, but Palmer hit Larry Fitzgerald (could he be traded by Tuesday?) on a 19-yard TD pass with 32 seconds left in OT for the 18-15 win. This one should be another offensive slog - it has the lowest total on the board. The Pick: 49ers and under.